In a single generation, Asia has transformed itself from a low-income continent to a middle-income one. In 1991 more than 90 percent of the region’s population still lived in low-income countries. By 2015, more than 95 percent lived in middle-income countries (Figure 1). Rapid growth propelled most of the region—including the most populous countries of China, India, and Indonesia—into middle-income status. Is the continent now on its way to reaching high income in the next generation? Source: Estrada et al. (forthcoming). Moving up to high income is particularly challenging, as the easy source of growth in early stages—increasing the amount of capital and labor used in production—can only take countries so far. Countries can only reach high income if their workers and companies become more efficient in using these inputs; in economists’ language, this means that total factor productivity (TFP) will need to play a larger role. TFP growth accounts for almost 30 percent of growth in middle-income countries that graduated to high income, but less than 10 percent of those that did not (Figure 2). But what can boost TFP growth? There is new evidence that TFP growth in middle-income countries depends on innovation, human capital, and infrastructure. Source: Eichengreen, Park, and Shin, forthcoming. 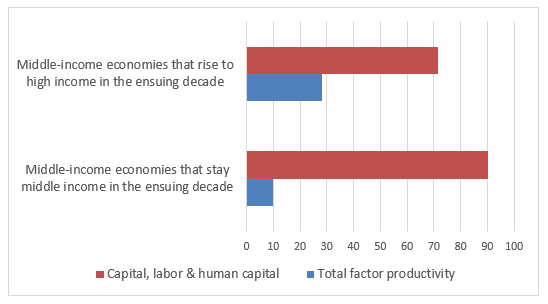 As countries develop their economies, traditional sources of productivity growth—such as shifting labor from agriculture to manufacturing or the imitation of foreign technologies—decline in importance. Innovation assumes a more central role, especially for upper middle-income countries. Middle-income economies that successfully graduated to high income had 2.5 times more research and development stock per worker as those that did not, for example. Risk-taking entrepreneurs often lead in fostering innovation, turning new ideas or technology into innovation-based productivity growth. As economies become more sophisticated, “opportunity-driven” entrepreneurship, which builds on new ideas or technology, outweighs “necessity-driven” entrepreneurship, which responds to existing market needs. The ratio of opportunity-driven to necessity-driven entrepreneurship is 1.6 times higher in high-income economies than in middle-income ones. Middle-income economies should encourage and nurture entrepreneurs to pursue new business opportunities and provide novel products and services. In addition to entrepreneurship, innovation requires a skilled and knowledgeable workforce capable of using and creating new technologies. In Asia, like elsewhere, human capital accumulation can promote both growth and equity. Estimates indicate that a 20 percent increase in human capital can raise labor productivity by up to 3.1 percent and narrow labor income inequality by up to 4.5 percent. The bonus in income growth is more salient among poorer families, which may explain the income-equalizing effect. The emphasis needs to be on ramping up the quality of Asia’s education. Economies with relatively high cognitive skills benefit from having a critical mass of students likely to become innovators. Research indicates that as economies move closer to the technological frontier the returns on research-oriented innovation pick up tangibly. In globally standardized math and science tests, the proportion of top-performing 15-year-old students in the advanced economies is on average 5 times the proportion in middle-income economies. An exception like Vietnam, which ranks eighth among the 72 economies covered, demonstrates that the gap can be closed with sound education policies. Advanced infrastructure such as information and communication technology (ICT) can help sustain growth in middle-income economies. The fastest-growing middle-income economies invest more in infrastructure and tend to have more of their infrastructure in sectors such as ICT. 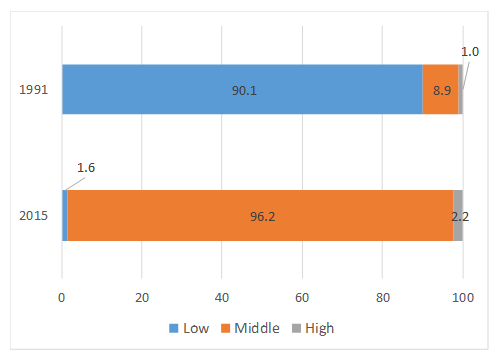 Middle-income economies that graduate to high income have 18 more internet users per 100 people and 31 more mobile phone subscriptions than their peers, for example. Mobile telephone and broadband networks are vital tools for creating and disseminating knowledge. Investment in advanced infrastructure can boost growth by promoting both innovation and human capital. Analysis of developing economies shows that a 1 percent GDP increase in public infrastructure investment lifts output by 0.3 percent in the same year and by nearly 1.2 percent after seven years. Sustaining rapid growth is not easy, but is within reach for middle-income Asia. Many norms that served the region well in the past, such as macroeconomic stability and high investment, still serve it well at middle income. Empirical estimates show that when a country reaches middle income, its growth rate is more vulnerable to indicators affecting macroeconomic stability—such as whether the country faces a banking or currency crisis, the extent of capital inflows other than foreign investment, and government debt as a share of GDP. At the same time, patterns of growth must evolve if Asia is to sustain rapid growth and eventually reach high income. The productivity-enhancing trinity of education, innovation, and infrastructure all have vital roles to play. The nexus of advanced infrastructure, highly developed skills, and innovative entrepreneurship can support Asia’s productivity growth and enable a successful transition to high income. The transition will not be easy, but Asia’s dynamic track record and strong fundamentals encourage optimism that the region can meet the middle-income challenge.